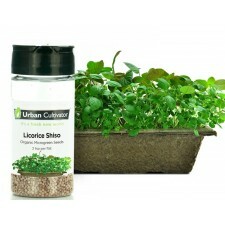 Organic Licorice Shiso seeds perfected for indoor growing. Grows four flats of Licorice Shiso microgreens. Shiso isn't very common in Western cooking, but in the world of Asian cooking, and in particular, Japanese cuisine, shiso, or 紫蘇, シソ, reigns supreme. Each Asian culture has a different name for the plant, and are incorporated into their respective cuisines in unique ways. The crop grows in red/purple and green varieties, though the green is far more prominent than the red. Green shiso is a bit spicy in flavor with a hint of cinnamon. The leaves are rich in calcium and iron, and because of its strong flavor, can stand up to such things as pickling. Most common uses of shiso include serving it with sashimi, wrapped around sushi, or added to soups, rice, and tempura.